The situation on the ground for Palestinian children is rapidly deteriorating. At the end of February, there were 440 Palestinian children in Israeli military detention. Some children are imprisoned indefinitely without charge or trial. The situation on the ground in the occupied West Bank, including East Jerusalem, is rapidly deteriorating. As your constituent, I urge you to join other members of Congress and sign-on to a Dear Colleague letter calling on President Obama to appoint a “Special Envoy for Palestinian Children.” Children under 18 years old now represent 46.2 percent of the 4.68 million Palestinians living in the Occupied Palestinian Territory. These youth are growing up under prolonged military occupation where systemic discrimination and violence has stifled future prospects. I am particularly concerned by the Israeli military’s widespread and systematic ill-treatment of Palestinian child detainees. 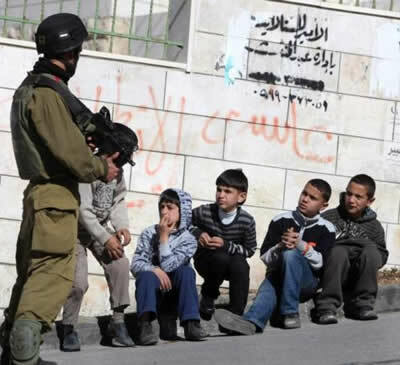 At the end of February, there were 440 Palestinian children in Israeli military detention. This is the highest number since data became available from the Israel Prison Service in 2008. For the first time in nearly four years, Israel has reintroduced the use of administrative detention against children, a procedure whereby a child can be detained without charge or trial, often renewable indefinitely. As a constituent, I urge you to sign-on by May 20th to the Dear Colleague letter initiated by Rep. Betty McCollum (D-MN) calling on President Obama to appoint a “Special Envoy for Palestinian Children” for a fact-finding mission that will provide the administration with information vital to actively promoting human rights. The Special Envoy will travel to the West Bank, including East Jerusalem, and Israel and hear directly from Palestinian youth, human rights and legal experts, NGOs, and Palestinian and Israeli officials. The United States has a critical role to play in shaping the environment for peace between the Israeli and Palestinian people. We urgently need you to send a clear signal that the American people value the lives and safety of Palestinian children.